Saturday afternoon found Laura and I driving to our third New Bedford restaurant to complete our three-per-city reviews. First was Me & Ed's, second was No Problemo, and straight ahead was our third ... and it was closed. Closed. The sign was right in the window. Well, didn't this just ruin all our plans? What to do? We have plenty of New Bedford favorites we could go to for lunch but we wanted some place new. As we were driving sort of aimlessly (and hungry), thinking up alternative plans, we drove right by The Symposium. Hey, we've never been here before and I'd read about it on MenuJoy.com. The sign said family dining (which usually means comfort foods) and we were in need of comfort at this time (we were teary-eyed, lol). So cold, tired, and very hungry, we entered the tidy building at 3:15 p.m.
What a cute place! Neat and clean and attractively decorated, it looked like it could accommodate maybe 40 to 50 diners. 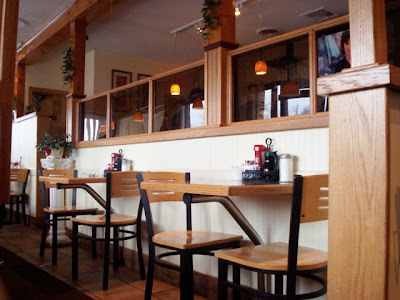 There were booths and tables on both sides of the building with a small kitchen in the middle. Although it was fairly quiet when we came in, within a few minutes all the booths were filled and the tables were getting busy. This must be a popular place. Hopefully, popular meant good food. We were approached by Shilah, who turned out to be a very pleasant and efficient waitress. She presented us with the menu, which is quite extensive. We gave her our order for two Diet Cokes and started to look over the choices. They have just about everything you could want here, plus many Greek selections. Appetizers include shrimp cocktail, stuffed quahogs, calamari, and tzatziki (plus wings and rings, etc.). They have salads, sandwiches (hot and cold), wraps, and burgers. 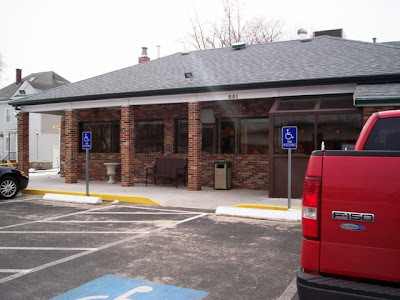 Their menu is extensive for seafood (fried and broiled), poultry and meats (including lamb chops, souvlaki, liver and onions, and French meat pie), and pasta and rice dishes. They even have a nice kids' menu with several kiddie selections. Plus, unbeknownst to us, they serve breakfast all day long and have all your A.M. favorites. If you can't find it here, I guess it doesn't exist. Click on the website above to get their complete menu. When Shilah returned with our sodas, we gave her our orders. 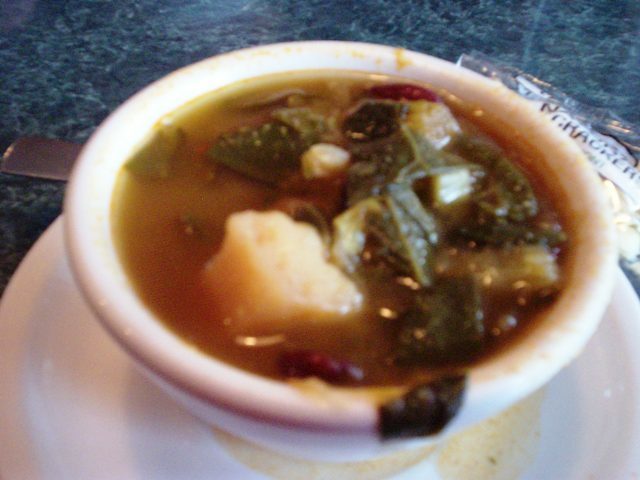 Laura decided on a cup of kale soup, baked stuffed scrod, oven-roasted potatoes, and beets. 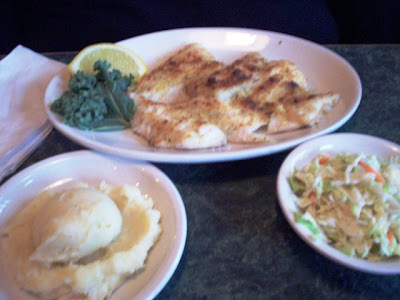 I chose broiled scrod, mashed potatoes, and cole slaw. 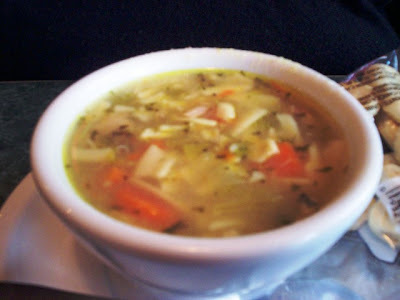 But I first started with chicken noodle soup. Our soups came quickly along with packaged crackers. It was all good! Laura found her kale soup very flavorful, rich, and hot. I found my chicken noodle soup the same. Hot, homemade, lots of veggies, chicken, and noodles - just delicious. If we were cold before, we weren't now. It was a great start. 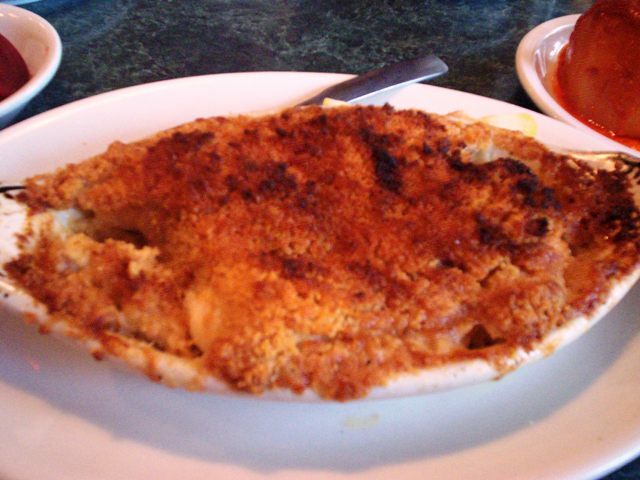 Laura's baked stuffed scrod arrived in its own casserole. It looked delicious and she declared it so. 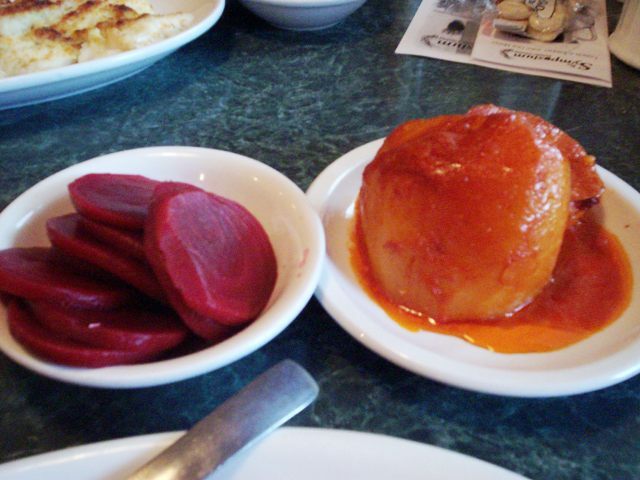 She loved the large disk-shaped beets and the way her potato was presented. It was a large spud cut in half and baked in an orangey sweet sauce that almost tasted like yams. She said it was fantastic, as was her whole meal. I had a nice helping of broiled scrod which was done perfectly. White, buttery and flaky, it fell apart easily with my fork. My mashed potatoes were real and nicely lumpy and flavorful. I passed my cole slaw over to Laura and she thought it needed a bit more mayo. My fish and potatoes were excellent, though. We passed on dessert (because we were stuffed), but I hear they have a great selection including tiramisu, Boston cream pie, and cheesecake. THE VERDICT: I'm so happy we passed by this place by accident. The next time we will be heading here on purpose, because we'll definitely be going back. Good food, great prices and nice people. Who could ask for anything more? With 20% tip, we left $38.50 for Shilah. She was fantastic! Before leaving, we checked out the restroom and found it neat and clean. 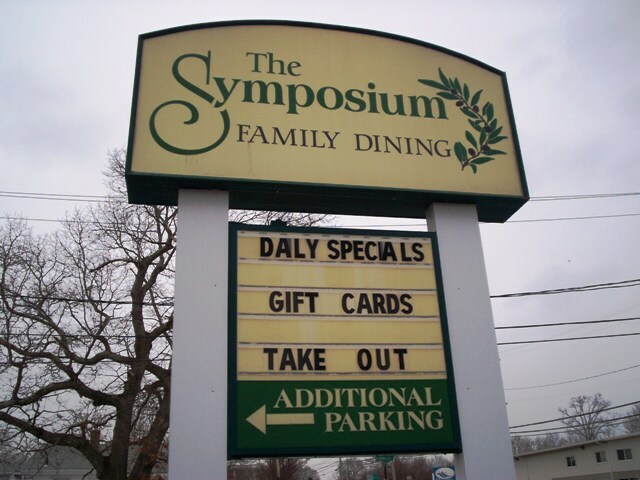 The Symposium is open from 7 a.m. to 8 p.m. Monday through Saturday, and 7 a.m. to 3 p.m. Sunday. 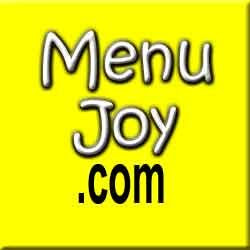 Check out our friends at MenuJoy.com for great area menus.